1892 was marked by celebrations of the 400th anniversary of Columbus's arrival in the Americas and to commemorate the event, Italians funded the dedication of Gaetano Russo's Columbus Circle stone monument on the perimeter of Central Park. 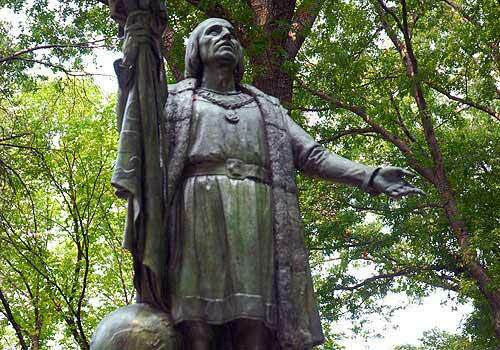 Another statue of Columbus, by Spanish sculptor Jeronimo Sunol, was unveiled on May 12, 1894 on the Mall. The Russo monument shows Columbus looking outward with his hand on the tiller of his ship, while the Sunol monument portrays a more spiritual explorer with his outstretched arm and eyes looking upward to heaven in gratitude for his successful voyage. Sunol modified this sculpture from one he had done in 1885 in the Plaza de Colon in Madrid.